This website is hosted on godaddy.com for past few months. It was fine until yesterday but since than I am told that it is down every hour. Jet pack is sending emails about it several times, every hour. I had thought Godaddy. Com was a serious host. Alas it is not. Like many before, it promised something, that it can not deliver. Only 8 people could land in past 18 hours. Shame on you godaddy. You too Brutus! Today (March 15) I received a warning email that website is consuming resources. I logged in Cpanel and found that yesterday there was IO error by consuming the allocated all the memory of 1024 MB. Today there was no problem but the website is loading slow. Unable to to update plugins and so on. I have taken a screen shot that there is no resource issue today but yet it took me two hours to edit this page. Does that means that I have bben cheated by Godaddy? This entry was posted in Blogging, Cheating and tagged Godaddy, Godaddy.com, Hosting review, Hosting solution, webhosts. Bookmark the permalink. Sorry to hear you’re having trouble with your site. I wanted to reach out to provide some clarity on the situation and a potential solution. Currently you’re on a cPanel shared hosting account. By sharing the server with other customers you can keep the costs of running your site much lower than running your own server. In order to ensure every customer receives what they pay for we place limits on each account. These limits prevent one customer from stealing all the resources and space on a server and creating a terrible experience for the rest of customers. To steal your word, they are a real Brutus. We like to work with everybody to ensure they are getting the best experience, so whenever a customer gets close to their limits we send an alert. Sometimes these alerts can be triggered by a particularly heavy script, in which case they can kill the process and evaluate prior to kicking it off again. In other cases, the site is growing and becoming more popular and the customer needs to purchase a bit more space to keep up with the demand. Either way we like to work with customers like yourself to let them know when they are getting close to that limit line and provide an easy path to purchasing more resources. 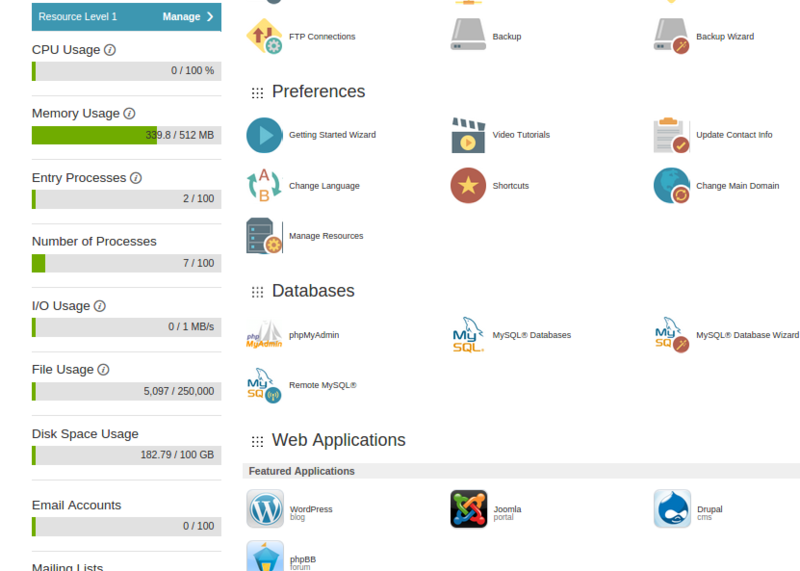 If you go in to your GoDaddy cPanel account you’ll see an option to manage your resources and several options to add more resources. Once you have selected the amount you need, click upgrade and you’re account will automatically receive the additional space and resources. Even better, if for some reason you realize you don’t need as many resources, you can downgrade at any time. If only you had read the whole article and explained as to what was wrong yesterday? It appears somebody out smarted your vps and clogged my site. For two hours it was barely loading. Thereafter I checked the resources, took a screen shot and added the second part. Would you find out what happened? Apologies on the confusion. Reading through your post and looking at your site it appears that you were growing and needed a bit more room to allow for that. From your description in the comment it is possible that you have been impacted by a set of database connection issues we have been working on. The good news is we have been actively working on this and you should already see a change. Please let me know if you’re still experiencing issues and I’ll take a closer look at what could be stressing these limits. Position is the same for past week. Your explanation simply does not cover the time period when I could check the resources in real-time and also access the website. See screen shot above.